The Space Invader (Caelus pervasor) is an alien monster. 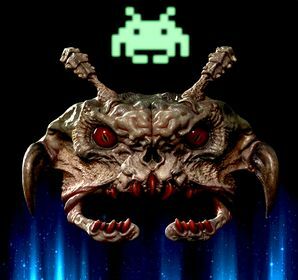 The Space Invader drops down from outer space in a predictable side-to-side motion. Its movements seem to be bound to fixed dimensions, and an observant hero will soon discern the pattern. Too bad observant heroes are rare. Most heroes, slack-jawed and attending to a voice that no one else can hear, miss the dull "womp womp" sound of the Space Invader as it descends. Reports about the size and shape of Space Invaders vary. Some claim that the creatures are massive, armored, and extremely arrogant demonic-insectile heads with pincer-like jaws and no proper body. Other accounts describe them as small, boxy, primitively rendered, and almost cute. All agree that their language skills are limited and that they cannot be reasoned with. 18:49 Stood over the slaughtered Space Invader and delivered a heartfelt requiem for its departed warrior soul. I then looted 6 coins and a recovery disk from the twitching corpse, which I think is a fair fee for a requiem these days. This page was last edited on 30 March 2019, at 10:40.